D.B. 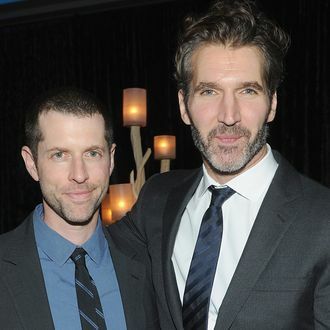 Weiss and David Benioff. Can you do sexposition in Star Wars? Disney announced Tuesday that Game of Thrones showrunners David Benioff and D.B. Weiss are getting put in charge of their own series of Star Wars films, separate from both the original Skywalker saga and Rian Johnson’s recently announced spinoff series. “David and Dan are some of the best storytellers working today,” Kathleen Kennedy, president of Lucasfilm, said in a statement. “Their command of complex characters, depth of story and richness of mythology will break new ground and boldly push Star Wars in ways I find incredibly exciting.” After finishing the final season of Game of Thrones, which won’t premiere in 2019, Benioff and Weiss were expected to work on their controversial alternate-history Civil War series Confederate for HBO; it’s not clear at the moment how that might conflict with an obligation to Lucasfilm. Anyway, the primary takeaway here is that the one thing Star Wars loves more than British brunette characters is white dude creators.